The most widely-used interactive multimedia presentation on the market. It's compelling and easy-to-follow, complete with audio, video, and graphic presentations. Realistic practice tests will let you know when you're ready for the real thing. Our lesson plan walks you systematically through every topic required for certification. Our extensive test database makes you comfortable with the topics you'll be seeing on the national exam. For just $299, you gain access to a program that will have you ready to get your certification in less than one year! Designed for high school seniors and up, this extended learning training package offers you a rich multimedia experience packed with all the vital information you need to prepare for the pharmacy technician certification and meet state board of pharmacy criteria. Open our Section Tutorials and you step into a learning environment that provides the student with 240 hours of curriculum. 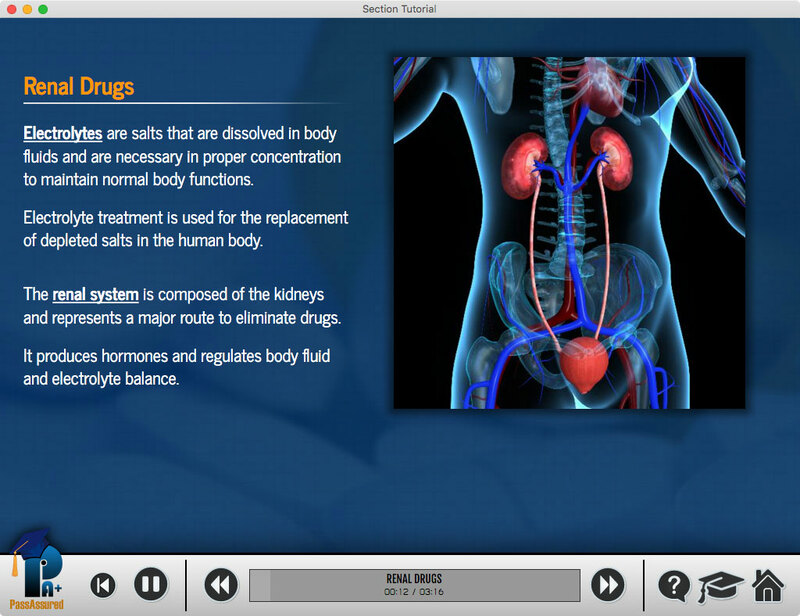 The video coaching and audio blended with over 2500 images enables the student to fully absorb and retain the course work. The comprehensive Learn Files offer the student pre-written notes aligned with the videos and contain more than twice the information. Studying the Learn Files is critical to passing the tests and exams. Created in a working pharmacy, the self-paced Student Edition illustrates actual duties of a pharmacy technician from greeting customers to performing basic aseptic techniques. Easy to follow animated calculation illustrations clearly demonstrate methods for solving pharmacy math equations. Our unique testing system utilizes an "earned" approach that rewards the student's success by opening them to greater challenges as they move to higher levels of learning. From the basic Section Test to the comprehensive exams, our testing system is designed to enhance and promote the highest student retention levels. The Student Edition is the ultimate learning experience. The educator has secure access to automated facilities to administer the class. Facilities include automated test grading systems, the ability to grant/deny student access to exams, and a process for viewing all student activity. The Educator Control Panel was developed by a panel of educators with over 100 years of classroom experience. This feature rich facility enables the educator to administer all aspects of student activity. Our built-in messaging system only allows messages to and from the educator and the student or students. Students are not allowed to send messages to another student. Additionally, our messaging system is not email, so viruses are not a concern.